Author: Edward M. Hallowell, M.D. ; Format: Hardcover; ISBN: 0375403574; Release Date: Sep 1999; List Price: $25.00; Publisher: Random House, Inc.; Length: 328 pages; Edition: 1. Condition: Good. Has highlighting on a few pages, significant shelfdust, and some minor outer wear. Jacket and cover are both still in overall nice shape, binding is strong, and pages are otherwise good. Same cover design as that shown here. The promise of wellness and satisfaction has never been as ubiquitous in our culture as it is now. Images of happy people stare out at us from magazine pages and television screens; they are successful and busy, hurrying from the office to the opera, eating healthfully and acting responsibly. 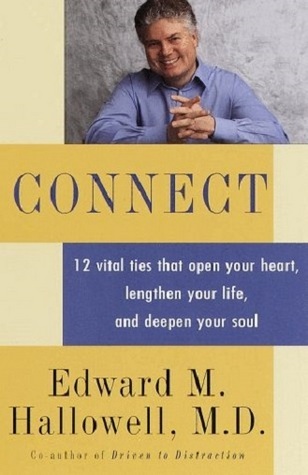 We are a nation of achievers but, as Dr. Edward Hallowell makes clear in Connect, what sustains us--emotionally, psychologically, physically--is connectedness, the feeling that we are part of something that matters, something larger than ourselves that gives life its meaning, direction, and purpose. Hallowell examines the real life most of us lead--overwhelmed, harried, pressured--and outlines the steps we can take to connect ourselves to the people and things that matter to us. He elevates the simplest forms of communication, understanding, and self-knowledge as examples of the human moment: the basis for the bridges we build to one another. He tells stories of personal growth--one woman's plan to bring a neighborhood together, another woman's assembling of a makeshift family, a real estate developer's institution of company-wide weekly pizza dinners--and identifies in them twelve vital ties to a more connected life. Hallowell concludes that within each of us exists the capacity to connect with the people around us--our parents, spouses, children, friends, and colleagues--to become who we want to be and to be happy with who we are.